Watercolour of two women grinding, by Bani Lal (c.1850-1901), part of the Archer Collection, c. 1880. The artist Bani Lal was known for his watercolours that portray Indian people performing trades and occupations. 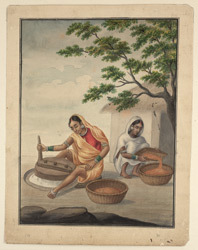 This drawing is rendered in the Patna style of Company painting and depicts two women grinding spices outside of a hut. Company painting is a style of miniature painting that developed in the second half of the 18th century in response to the tastes and influences of the British serving with the East India Company. The style first emerged in Murshidabad in West Bengal and subsequently spread to other British centres, the most notable being Patna, Benares (Varanasi), Delhi andLucknow. Patna is in Bihar and is situated on the southern bank on the Ganges River.